You can configure Kerberos network authentication for communication between the cluster and clients, for communication between the cluster and core filers, or for both. 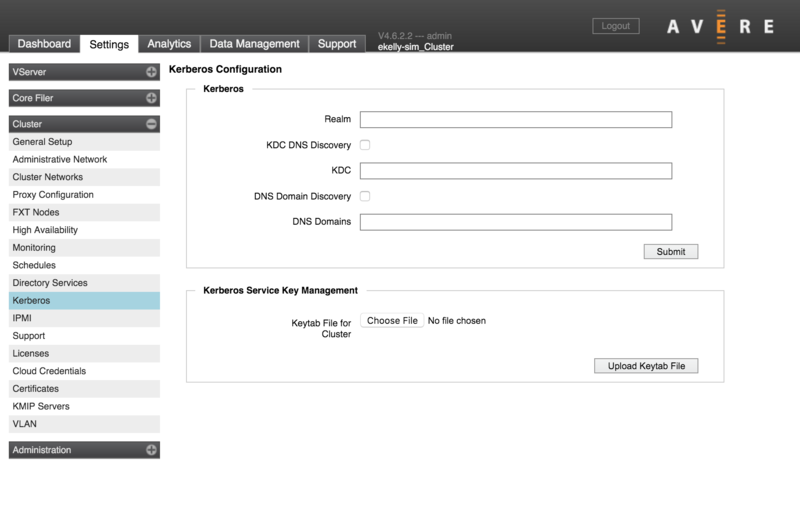 This settings page includes basic configuration for all Kerberos communication, and also allows you to upload a key file to use with cluster-core filer operations. Additional settings are needed to enable Kerberos for client-cluster or cluster-core filer operations. Read Setting Up Kerberos Authentication to learn more about how Kerberos is configured in Avere OS. Use the Kerberos panel to specify infrastructure settings that are used by all Kerberos connections in the cluster. In the Realm field, enter the Kerberos realm (domain) that contains the principal names in the Kerberos server database (for example, company.net). Note that Kerberos cannot service requests outside its realm, so make sure that the realm encompasses all vservers and core filers for which you want to use Kerberos. You can use DNS to specify additional members of this realm. This feature assigns clients that do not have explicit realms to a realm based on their domain name. DNS Domain Discovery uses DNS to automatically determine the realm of a host. Be cautious when using the domain discovery option, because it can lead to more security vulnerabilities than the explicit DNS domain mapping option. In the DNS Domains field, enter a space-separated list of domain or host names to add to the Kerberos realm. This option is more secure than the domain discovery option. Select KDC DNS Discovery if you want Avere OS to search for the key distribution center. In the KDC field, enter IP addresses or DNS hostnames for the Kerberos KDC servers. (This option is available only if KDC DNS Discovery is not selected.) Separate multiple values with spaces. Use the Kerberos Service Key Management panel to upload a keytab file for authenticating communication between the cluster and core filers. This file is different from the Kerberos keytab file uploaded on the VServer > NFS settings page. That file is used for client-vserver communication. Read Setting Up Kerberos Authentication to learn more about the different types of Kerberos configurations in Avere OS.